In the recent election five states voted upon the question of equal suffrage. Oregon, Arizona, Kansas and Michigan adopted it, and Wisconsin refused it. There were already six other states where equal suffrage was the law, they being Wyoming, Colorado, Washington, California, Idaho and Utah. With the four new states, equal suffrage now has 70 electorial [sic] votes, enough if they combined and cared to use them to cut some ice in presidential elections. The battle has been long, but it is now won, or at least so far fought out that the end can be seen, and that is the adoption of the system by every state in the Union. Probably another decade will be required to make it unanimous, but it is only a question of time now. 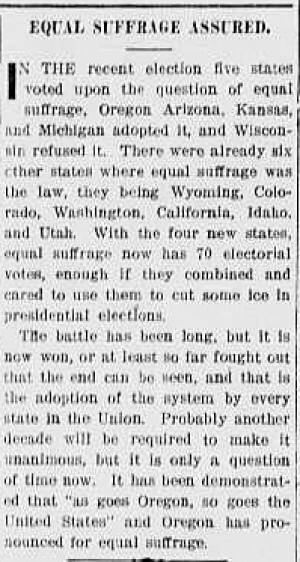 It has been demonstrated that “as goes Oregon, so goes the United States” and Oregon has pronounced for equal suffrage.